It is unclear how long he was ‘down’ for before he was ‘discovered’ by his colleagues. 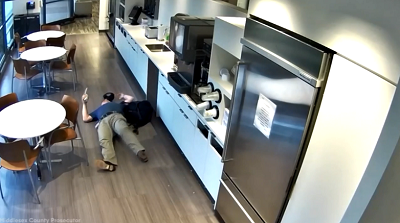 A man from New Jersey, US, was reportedly arrested and charged for faking a fall at a company he was subcontracted to work for. In CCTV footage that was released, the 57-year-old is seen filling a cup with ice, only to toss the ice on the floor. He then carefully walks towards the ice and uses a counter to support himself from actually falling as he fakes his fall onto the floor. The Middlesex County Prosecutor’s Office told America’s Eyewitness News that the man waited for people to ‘discover’ him on the ground presumably to have witnesses for an insurance claim he later filed for the ambulance service and treatment he received at a hospital for his ‘injuries’. He was arrested and charged with insurance fraud and theft by deception and would reportedly appear in court on Thursday.